Grinnell College is a private liberal arts college in Grinnell, Iowa. It was founded in 1846 when a group of New England Congregationalists established the Trustees of Iowa College. Grinnell is known for its rigorous academics, innovative pedagogy, and commitment to social justice. Grinnell has the sixth highest endowment-to-student ratio of liberal arts colleges, enabling need blind admissions and substantial academic merit scholarships to boost socioeconomic diversity. Students receive funding for unpaid or underpaid summer internships and professional development (including international conferences and professional attire). Grinnell participates in a 3–2 engineering dual degree program with Columbia University, Washington University in St. Louis, and California Institute of Technology, a 2–1–1–1 engineering program with Dartmouth College and a Master of Public Health cooperative degree program with University of Iowa. Nearly half of enrolled Grinnellians self-identify as international students or students of color. Among Grinnell alumni are 14 Rhodes Scholars, 119 Fulbright Scholars (Since 2005), 79 Watson Fellows, 13 Goldwater Scholars, and one Nobel laureate. Its alumni include actor Gary Cooper, chemist Thomas Cech, Intel co-founder Robert Noyce, jazz musician Herbie Hancock, government administrator Harry Hopkins, and comedian Kumail Nanjiani. The 120-acre campus includes several listings on the National Register of Historic Places as well as a César Pelli designed ultra-modern student center, integrated academic complexes, and state-of-the-art athletics facilities. Grinnell College also manages significant real estate adjacent to the campus and in the historic downtown, a free-access golf course, and the 365-acre Conard Environmental Research Area. U.S. News & World Report ranked Grinnell 11th best overall and 2nd best for undergraduate teaching among liberal arts colleges. In 1843, eleven Congregational ministers, all of whom trained at Andover Theological Seminary in Massachusetts, set out to proselytize on the frontier. Each man pledged to gather a church and together the group or band would seek to establish a college. When the group arrived in Iowa later that year, each selected a different town in which to establish a congregation. In 1846, they collectively established Iowa College in Davenport. A few months later, Iowa joined the Union. The first 25 years of Grinnell's history saw a change in name and location. 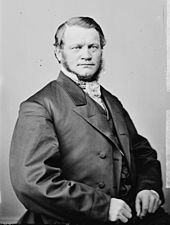 Iowa College moved farther west from Davenport, Iowa, to the town of Grinnell and unofficially adopted the name of its new home, which itself had been named for one of its founders: an abolitionist minister, Josiah Bushnell Grinnell, to whom journalist Horace Greeley supposedly wrote "Go West, young man, go West." However, Greeley vehemently denied ever saying this to Grinnell, or to anyone. The name of the corporation, "The Trustees of Iowa College," remained, but in 1909 the name "Grinnell College" was adopted by the trustees for the institution. Josiah Bushnell Grinnell: one of the four founders of Grinnell, Iowa and benefactor of Grinnell College. In 1882, Grinnell College was struck by a tornado — then called a cyclone, after which the college yearbook was named. The storm devastated the campus and destroyed both College buildings. Rebuilding began immediately, and the determination to expand wasn't limited to architecture: the curriculum was again extended to include departments in political science (the first in the United States) and modern languages. Concern with social issues, educational innovation, and individual expression continue to shape Grinnell. As an example, the school's "5th year travel-service program," preceded the establishment of the Peace Corps by many years. Other recent innovations include first-year tutorials, cooperative pre-professional programs, and programs in quantitative studies and the societal impacts of technology. Every year, the college awards the $100,000 Grinnell College Innovator for Social Justice Prize, which is split between the recipient and their organization. 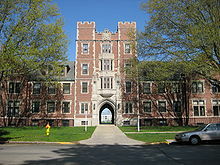 Grinnell College is located in the town of Grinnell, Iowa, about halfway between Des Moines and Iowa City. The main campus is bounded by 6th Avenue (which is also US Highway 6) on the south, 10th Avenue on the north, East Street on the east and Park Street on the west. The 120-acre (0.49 km2) campus contains sixty-three buildings ranging in style from Collegiate Gothic to Bauhaus. Goodnow Hall and Mears Cottage (1889) are listed on the National Register of Historic Places. 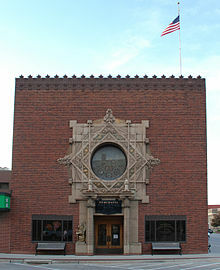 Immediately west of the college is the North Grinnell Historic District, which contains over 200 National Register of Historic Places contributing buildings. East Campus dormitories connected by Grinnell's distinctive loggia. The residential part of campus is divided into three sections: North Campus, East Campus, and South Campus. North and South Campus' dormitories are modeled explicitly after the residential colleges of Oxford and Cambridge. The four East Campus dormitories were designed by William Rawn Associates and feature a modern, LEED-certified design constructed from Iowa limestone. All three campuses feature dormitory buildings connected by loggia, an architectural signature of the college. The loggia on South Campus is the only entirely closed loggia, featuring walls on all sides, while the loggias on East and North campus are only partially closed. From the time that the first dorm opened in 1915 until the fall of 1968, the nine north campus dorms were used exclusively for male students, and the six south campus dorms reserved for female students. The dorm halls house significantly fewer students than halls at other colleges. Most academic buildings are located on the southwestern quarter of campus. The athletic facilities are mostly located on the northeastern quarter, and some facilities are located north of 10th Avenue. In addition to the main campus, the college owns much of the adjacent property. Many administrative offices are located in converted houses across Park Street near the older academic buildings, and several residences are used for college-owned off-campus student housing. 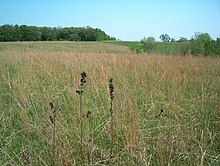 The college maintains a 365-acre (1.48 km2) environmental research area called the Conard Environmental Research Area (CERA). The U.S. Green Building Council awarded CERA's Environmental Education Center a gold certification. The building is the first in Iowa to receive the designation. During the 2000s, the College completed the Charles Benson Bear '39 Recreation and Athletic Center, the Bucksbaum Center for the Arts, the renovation of the Robert Noyce '49 Science Center and the Joe Rosenfield '25 Student Center. Internationally renowned architect César Pelli designed the athletics center, the Joe Rosenfield '25 Student Center, and the Bucksbaum Center for the Arts. The college has recently embarked on a significant period of new construction, which is expected to last until 2034. The first phase of this construction process includes a comprehensive landscaping update, a new Admissions and Financial Aid building, and the Humanities and Social Sciences Complex (HSSC). This first phase will cost $140 million and is projected for completion in mid-2020. Grinnell College is nationally recognized as a leading undergraduate institution. In July 2006, The New York Times included Grinnell in its profile of the 20 colleges and universities of "established or rising scholarship" which are fast becoming viable alternatives to Ivy League institutions, and is considered one of the 30 Hidden Ivies. The 2018 annual ranking of U.S. News & World Report rates it tied for the 19th best liberal arts college in the nation and 4th for "Best Undergraduate Teaching." The College has been consistently ranked in the top 25 liberal arts colleges in the nation since the publication began in 1983. Kiplinger's Personal Finance ranks Grinnell 9th in its 2016 ranking of "best value" liberal arts colleges in the United States. Grinnell was ranked 15th in the 2015 Washington Monthly rankings, which focus on key outputs such as research, dollar value of scientific grants won, the number of graduates going on to earn Ph.D. degrees, and certain types of public service. In Forbes magazine's 2018 rankings of academic institutions, "America's Top Colleges" (which uses a non-traditional ranking system based on RateMyProfessors.com evaluations, notable alumni, student debt, percentage of students graduating in four years, and the number of students or faculty receiving prestigious awards), Grinnell College was ranked 57th among all colleges and universities, 28th among liberal arts colleges, and 8th in the Midwest. Data from 2006 placed Grinnell at number eight among all U.S. undergraduate institutions in the proportion of graduates who go on to earn Ph.D. degrees and 15th for graduating female Ph.D. earners. Grinnell College graduates enjoy a high acceptance rate to law school; over 46% of all applications submitted by students have been accepted by law schools. Unigo.com's 2010 college rankings place Grinnell College in the "Top 10 Colleges Where the Pursuit of Knowledge Goes Outside the Classroom". Grinnell had 171 full-time faculty in Fall 2015, 98% of whom possess a doctorate or the terminal degree in their field. At the end of each semester, students fill out course surveys which play a large role in determining faculty tenure decisions and merit raises. Grinnell's open curriculum encourages students to take initiative and to assume responsibility for their own courses of study. The sole core, or general education, requirement is the completion of the First-Year Tutorial, a one-semester, four-credit special topics seminar that stresses methods of inquiry, critical analysis, and writing skills. All other classes are chosen, with the direct guidance of a faculty member in the student's major department, by the student. The academic program at Grinnell College emphasizes active learning and one-on-one interactions between faculty members and students. There are few large lecture classes. In sharp contrast to all public universities and many private universities in the United States, no classes, labs or other courses are taught by graduate students. Grinnell College expects all students to possess significant academic achievements. For example, the math department does not offer any basic-level classes such as college algebra, trigonometry, or pre-calculus, and remedial classes are not offered in any subject. However, several independent, non-credit programs assist students who need help in a specific subject. Among these programs are the Library Lab, Math Lab, Reading Lab, Science Learning Center, and the Writing Lab. While private tutors can be hired, participation in these programs is free for any enrolled student. Grinnell has twenty-six major departments and ten interdisciplinary concentrations. Popular majors include Psychology, Economics, Biology, History, English, and Political Science. The minimum requirements in a major area of study are typically limited to 32 credits in a single department, with some departments additionally requiring a small number of classes in related fields that are deemed critical for all students in that field. For example, the biology program requires 32 credits in the biology department plus two classes in chemistry and one in math. Many students exceed the minimum requirements. To graduate, students are normally expected to complete at least 32 credits in a major field and a total of 124 credits of academic work. To encourage students to explore courses outside of their primary interest area, no more than 48 credits in one department and no more than 92 credits in one division are counted towards this requirement. Grinnell's commitment to the importance of off-campus study reflects the school's emphasis on social and political awareness and the international nature of its campus. Approximately 60 percent of all Grinnell students participate in at least one of more than seventy off-campus programs, including the Grinnell-in-London program and study tours of China, France, Greece, and Russia. These study programs in Europe (including Russia), Africa, the Near East, and Asia, as well as nine programs in Central and South America, provide the opportunity for research in many disciplines, from archaeology to education to mathematics. In addition to off-campus programs, Grinnell offers internship programs in such areas as urban studies, art, and marine biology for students interested in field-based learning and experience in professional settings. Second- and third-year students may apply for summer internship grants and receive credit for the experience. Semester programs in the United States include those at Oak Ridge National Laboratory, Newberry Library, National Theatre Institute, and Grinnell-in-Washington, D.C.
Grinnell also has invested in several interdisciplinary programs: the Center for Prairie Studies, Center for the Humanities, Center for International Studies, Noun Program in Women's Studies, Peace Studies Program, Rosenfield Public Affairs Program, and the Donald L. Wilson Program in Enterprise and Leadership. U.S. News & World Report classifies Grinnell's selectivity as "most selective." For Fall 2015, Grinnell received 6,414 freshmen applications; 1,598 were admitted (24.9%). Of the 41% of enrolled freshmen who submitted class rank, 81% were in the top 10% of their high school classes and 96% were in the top quarter. The middle 50% range of SAT scores for the enrolled freshmen was 640–740 for critical reading and 660–770 for math, while the ACT Composite range was 30–33. Grinnell College's admission selectivity rating, according to The Princeton Review in 2008, is a 95 out of 99. This rating is determined by several institutionally reported factors, including: the class rank, average standardized test scores, and average high school GPA of entering freshmen; the percentage of students who hail from out-of-state; and the percentage of applicants accepted. The primary factor in evaluating applicants is the quality of the education they have received, as shown by their transcript. Additional factors include standardized test scores, student writing skills, recommendations, and extracurricular activities. Early decision rounds are offered to students in the fall; most students apply in January of their final year in high school. Admission decisions are released by April 1 of each year. All students begin classes in August. The students' expectation of needing financial assistance does not affect the admission process. Despite the growing trend of U.S. students taking five or more years to finish an undergraduate degree, Grinnell College is strongly oriented towards students being enrolled full-time in exactly eight consecutive semesters at the college, although exceptions are available for medical issues and other emergencies. To avoid being suspended from the college, students must make "normal progress towards graduation." This generally means that the student must pass at least 12 credits of classes in each individual semester, with grades C or higher, and have accumulated enough credits to make graduation possible at the end of four years, which requires an average of 15.5 credits each semester. A student who is not making normal progress towards graduation is placed on academic probation and may be dismissed from the college. Nationwide, only 20% of college students complete a four-year undergraduate degree within four years, and only 57% of college students graduate within six years. However, at Grinnell College, 84% of students graduate within four years. This is the highest graduation rate of any college in Iowa. Grinnell's combined tuition, room, board, and fees for the 2013–2014 academic year is $53,654. Tuition and fees are $43,656 and room and board are $9,998. Grinnell College is one of a few dozen US colleges that maintain need-blind admissions and meets the full demonstrated financial need of all U.S. residents who are admitted to the college. Grinnell offers a large amount of need-based and merit-based aid in comparison with peer institutions. About 90% of students receive some form of financial aid. In 2013–2014, 24% of students enrolled at Grinnell College were receiving federal Pell Grants, which are generally reserved for students from low-income families. The average financial aid package is over $26,000. With the first-year students enrolled in the 2006–2007 school year, Grinnell has ended its need-blind admissions policy for international applicants. Under the old policy, students from countries outside the U.S. were admitted without any consideration of their ability to afford four years of study at the college. However, financial aid offers to these students were limited to half the cost of tuition. International students frequently carried very high workloads in an effort to pay the bills, and their academic performance often suffered. Under the new "need-sensitive" or "need-aware" policy, international students whose demonstrated financial needs can be met are given a slight admissions edge over applicants who can't. The twin hopes are that the enrolled international students will be able to dedicate more energy to their schoolwork, and also that this will ultimately allow the college to provide higher tuition grants to international students. Additionally, several extremely competitive "special scholarships" were set up to meet the full demonstrated financial needs for students from the following countries or regions: Africa, Eastern and Central Europe, Latin America, Middle East and Asia, Nepal, the People's Republic of China, as well as for native speakers of Russian regardless of citizenship, available every other year. According to data for students enrolled approximately in 2008, the median family income for students was US$119,700 (74th percentile). This is somewhat lower than typical for other highly selective schools. Compared to other schools in the Midwestern Conference and to other highly selective schools, Grinnell College enrolled more students whose family income was in the lowest quintile (6.3% of enrolled students). The school's varsity sports teams are named the Pioneers. They participate in eighteen intercollegiate sports at the NCAA Division III level and in the Midwest Conference. In addition, Grinnell has several club sports teams that compete in non-varsity sports such as volleyball, sailing, water polo, ultimate and rugby union. Nearly one-third of recent Grinnell graduates participated in at least one of varsity sports while attending the college and the college has led the Midwest Conference in the total number of Academic All-Conference honorees in last six years. The men's water polo team, known as the Wild Turkeys, were runners-up in the 2007 College Water Polo Association (CWPA) Division III Collegiate National Club Championships hosted by Lindenwood University in St. Charles, Missouri. They also qualified for the tournament in 2008, 2009, 2011, 2013, and 2014. The Men's Ultimate team, nicknamed the Grinnellephants, qualified in 2008 for its first Division III National Championship in Versailles, Ohio. The Women's Ultimate team, nicknamed The Sticky Tongue Frogs, tied for third place in the 2010 Division III National Championship in Appleton, Wisconsin. The success was repeated in 2011 when the men's team placed third in 2011 Division III National Championship in Buffalo. In February 2005, Grinnell became the first Division III school featured in a regular season basketball game by the ESPN network family in 30 years when it faced off against the Beloit Buccaneers on ESPN2. Grinnell lost 86–85. Grinnell College's basketball team attracted ESPN due to the team's run and gun style of playing basketball, known in Grinnell simply as "The System." Coach Dave Arseneault originated the Grinnell System that incorporates a continual full-court press, a fast-paced offense, an emphasis on offensive rebounding, a barrage of three-point shots and substitutions of five players at a time every 35 to 40 seconds. This allows a higher average playing time for more players than the "starters" and suits the Division III goals of scholar-athletes. "The System" has been criticized for not teaching the principles of defense. However, under "The System," Grinnell has won three conference championships over the past ten years and have regularly placed in the top half of the conference. Coach Arseneault's teams have set numerous NCAA scoring records and several individuals on the Grinnell team have led the nation in scoring or assists. On November 19, 2011 Grinnell player Griffin Lentsch set a new Division III individual scoring record in a game against Principia College. The 6-foot-4-inch (1.93 m) guard scored 89 points, besting the old record of 77, also set by a Pioneers player—Jeff Clement—in 1998. Lentsch made 27 of his 55 shots, including 15 three-pointers as Grinnell won the high-scoring game 145 to 97. On November 20, 2012 Grinnell's Jack Taylor broke Lentsch's scoring record, as well as the records for NCAA and collegiate scoring, in a 179–104 victory over Faith Baptist Bible. Taylor scored 138 points on 108 shots, along with 3 rebounds, 6 turnovers and 3 steals. Taylor went 27–71 from behind the arc. Taylor scored 109 points in a November 2013 game against Crossroads College to become the first player in NCAA history to have two 100-point games. Students at Grinnell adhere to an honor system known as "self-governance" wherein they are expected to govern their own choices and behavior with minimal direct intervention by the college administration. By cultivating a community based on freedom of choice, self-governance aims to encourage students to become responsible, respectful, and accountable members of the campus, town, and global community. The organizational structure of the Student Government Association, wielding a yearly budget of over $450,000 and unusually strong administrative influence, covers almost all aspects of student activity and campus life. Founded in November 2000, the student-run Student Endowment Investing Group (SEIG), actively invests over $100,000 of Grinnell College's endowment in the stock market. The group's mission is to provide interested students with valuable experience for future careers in finance. Service organizations are popular. The Alternative Break ("AltBreak") program takes students to pursue service initiatives during school holidays, and as of 2005, Grinnell had more alumni per capita serving in the Peace Corps than any other college in the nation. The college also runs its own post-graduation service program known as Grinnell Corps in Grinnell, China, Namibia, New Orleans, and Thailand, and has previously operated programs in Greece, Lesotho, Macau, and Nepal. The Scarlet and Black is the campus newspaper and KDIC (88.5 FM) is the student-run radio station. The Scarlet and Black, or the S&B is the first college newspaper west of the Mississippi River and is currently in its 130th year of publication. The newspaper, typically 16 tabloid pages in length, is published in print most Fridays of the school year and online. Students primarily write the newspaper, although occasional letters from alumni or faculty are included. Funding comes from student fees and advertisers. The school also has a monthly satirical newspaper, "The B&S", which features made-up articles about current events both on and off campus. In April 2007, Grinnell college students founded the Social Entrepreneurs of Grinnell, a student operated microfinance lending institution. The group collects donations for the purpose of making small loans at zero interest to business owners and artisans around the world. It is affiliated with kiva.org. Grinnell also has an entirely student-run textbook lending library on campus. Aimed at the economically disadvantaged yet open to all, it allows students to check out books for the semester for free, defraying the high cost of college textbooks. The library has no funding, relying solely on books donated. Since its founding in 2005, the collection has grown to thousands of books due to the generosity of the campus community. The library has expanded to include caps and gowns, which are lent out to graduating seniors every spring. Grinnell hosts the Titular Head film festival. In 2016, Grinnell students founded the Union of Grinnell Student Dining Workers, or UGSDW, to represent student workers in the College's dining hall. It was the first undergraduate student union at a private college in the United States. Since its founding, UGSDW has secured numerous wage increases and benefits for dining hall workers. In September 2017, UGSDW announced their intention to expand the union to all student workers and create "the most unionized campus in the country," which, if successful, would be another nationwide first. This effort received considerable resistance from College administration, which claims complete unionization "would negatively impact Grinnell’s mission and culture — shifting away from an individually advised, experiential, residential, liberal arts education in which work on campus plays a major educational role." UGSDW won their subsequent NLRB election by a margin of 5 to 1, but Grinnell College filed a request for review to the National Labor Relations Board. This move would likely have lead to an overturn of the Columbia decision, which affirms the right of student workers to organize across the United States. Acknowledging the possible ramifications of the College's actions, UGSDW withdrew their petition from NLRB consideration on December 14, 2018 but vowed to continue fighting for total expansion of representation on campus. Hallie Flanagan, 1911, pioneer of experimental theatre and director, the Federal Theatre Project of the Works Progress Administration; first woman to win a Guggenheim. Harry Hopkins, 1912, senior advisor to Franklin Delano Roosevelt, principal architect of New Deal, WPA administrator. Joseph Welch, 1914, head attorney for United States Army during Army-McCarthy Hearings. Gary Cooper, 1922, Academy Award-winning actor, best known for High Noon. Amy Clampitt, 1941, poet and critic. Robert Noyce, 1949, co-founder of Intel, co-inventor of integrated circuit (the other co-inventor, Jack Kilby, won the 2000 Nobel Prize in Physics for the integrated circuit), National Medal of Science recipient. Herbie Hancock, 1960, Grammy Award-winning jazz musician and composer. Thomas Cech, 1970, co-winner of 1989 Nobel Prize in Chemistry, president of Howard Hughes Medical Institute. Tom Cole, 1971, U.S. Congressman of Oklahoma's 4th District. Edward Hirsch, 1972, poet and critic. Bernice King, 1985, American minister, best known as the youngest daughter of slain civil rights leader, Dr. Martin Luther King and Coretta Scott King. Ian Roberts, 1987, actor and co-founder of the Upright Citizens Brigade. Kumail Nanjiani, 2001, Academy Award nominated writer, actor and comedian, best known for role on TV series Silicon Valley and co-authorship and performance in film The Big Sick. ^ As of June 30, 2017. "Tiny Iowa School Leads Endowments With 18.8% Investment Return". Bloomberg. 2017. ^ a b c d e f "Grinnell College Common Data Set 2015–2016" (PDF). Grinnell College. ^ "College Navigator - Grinnell College". National Center for Education Statistics. ^ Grinnell College Graphic Standards Manual (PDF). Grinnell College. Retrieved 2016-02-23. ^ "Grinnell College - Profile, Rankings". Archived from the original on 2017-02-27. 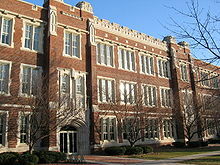 ^ a b "Grinnell College - A private liberal arts college in Iowa". www.grinnell.edu. Retrieved 2018-05-02. ^ "Grinnell College - The Princeton Review College Rankings & Reviews". www.princetonreview.com. Retrieved 2018-05-02. ^ "CLS Grants & Funding | Grinnell College". www.grinnell.edu. Retrieved 2018-09-05. ^ "3–2 Engineering Program | Grinnell College". www.grinnell.edu. Retrieved 2018-09-05. ^ Engineering, Thayer School of. "Dual-Degree Program | Thayer School of Engineering at Dartmouth". engineering.dartmouth.edu. Retrieved 2018-09-05. ^ "Recent Recipients | Grinnell College". www.grinnell.edu. Retrieved 2018-10-19. ^ "Best Athletic Facilities | The Princeton Review". www.princetonreview.com. Retrieved 2018-05-02. ^ "Grinnell College Buys Downtown Properties, Plans Demolition of Vacant Building | Grinnell College". www.grinnell.edu. Retrieved 2018-05-02. ^ "Grinnell College Golf Course | Iowa Public Golf | Iowa Golf Course". Grinnell College Golf Course. Retrieved 2018-05-02. ^ Grinnell, Josiah (1891). Men and Events of Forty Years. Boston: D. Lothrop. p. 87. Retrieved 12 February 2009. ^ Wall, Joseph Frazier. Grinnell College in the Nineteenth Century: From Salvation to Service. (Ames: Iowa State University Press), 91–92. ^ Morgan, J. (1969). "The Development of Sociology and the Social Gospel in America". Sociological Analysis. Oxford University Press. 30 (1): 42–53. doi:10.2307/3709933. JSTOR 3709933. . see footnote 4. ^ Handy, Robert (1950). "George D. Herron and the Kingdom Movement". Church History. American Society of Church History. 19 (2): 97–115. doi:10.2307/3162192. JSTOR 3162192. ^ McHale, Cathryn (1935). "Education for Women: The significance of Present-Day College Education for Women and Curriculum Changes". Journal of Higher Education. ^ "Grinnell Prize | Grinnell College". www.grinnell.edu. Retrieved 2018-05-08. ^ S.J. Klingensmith. "Goodnow Hall". National Park Service. Retrieved 2016-04-20. ^ S.J. Klingensmith. "Mears Hall". National Park Service. Retrieved 2016-04-20. ^ "Grinnell College - William Rawn Associates". rawnarch.com. ^ "East Campus receives LEED certification". Archived from the original on May 16, 2008. Retrieved May 7, 2013. ^ "Residence Halls". Grinnell College. Retrieved 18 February 2013. ^ United States Green Building Council. "Cera Environmental Education Center LEED Scorecard". Accessed May 14, 2007. ^ American Association for the Advancement of Sustainability in Higher Education. 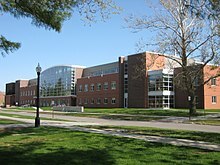 AAASHE Bulletin "Grinnell College Education Center Receives LEED Gold Certification", June 8, 2006. Retrieved 29 April 2008. ^ Hebel, Sara. "In Iowa, 2 Colleges Separated by 150 Miles and $1.37-Billion", The Chronicle of Higher Education, April 7, 2006. Retrieved 30 April 2008. ^ "Phase I of campus construction costs $140 million, prompts short-term endowment splurge". www.thesandb.com. Retrieved 2018-05-08. ^ "Timeline – Pushing beyond what's been done". comm.sites.grinnell.edu. Retrieved 2018-05-08. ^ Archibold, R.C. "Off the Beaten Path", The New York Times, 30 July 2006. ^ Greene, Howard; Greene, Mathew (2009). The Hidden Ivies. HarperCollins. ^ "Best Colleges – National Liberal Arts Colleges Rankings". U.S. News & World Report. 2018. Archived from the original on 2011-05-12. ^ "Kiplinger's Best College Values - 2016". Kiplinger's Personal Finance. December 2015. ^ "2015 Liberal Arts College Rankings". Washington Monthly. ^ Howard, Caroline (26 June 2018). "America's Top Colleges: The schools that matter most". Forbes. ^ Higher Education Data Sharing Consortium. "Weighted Baccalaureate Origins Study." 2006. ^ Unigo. "Nietzschean Supermen (and Superwomen)". unigo.com. ^ "SamR's Site: About End-Of-Course Evaluations". www.cs.grinnell.edu. ^ "Mathematics and Statistics courses offered". Archived from the original on 2010-06-20. ^ "Grinnell College Common Data Set 2016–2017" (PDF). Grinnell College. ^ "Grinnell College Common Data Set 2014–2015" (PDF). Grinnell College. ^ "Grinnell College Common Data Set 2013–2014" (PDF). Grinnell College. ^ "Grinnell College Common Data Set 2012–2013" (PDF). Grinnell College. ^ "Best Colleges – National Liberal Arts Colleges Rankings". U.S. News & World Report. 2016. ^ The Princeton Review. Grinnell College. Retrieved 23 November 2008. ^ Grinnell College Admission FAQ Archived 2008-05-14 at the Wayback Machine. Retrieved 15 May 2008. ^ Grinnell College. "Academic Catalog: Academic Regulations"
^ Stixrud, William; Johnson, Ned (2018-11-19). "When a College Student Comes Home to Stay". The New York Times. ISSN 0362-4331. Retrieved 2018-12-06. ^ "Best Colleges: Grinnell College". US News and World Report. 2018. ^ Fleig, Shelby (22 October 2018). "Grinnell named best college in Iowa, but not for its tuition. Where does your school rank?". Des Moines Register. Retrieved 2018-12-06. ^ Grinnell College, Office of Admissions Archived 2009-08-31 at the Wayback Machine. Retrieved 28 December 2012. ^ Grinnell College, Office of Admission. Tuition & Fees Archived 2007-02-06 at the Wayback Machine. Retrieved 26 February 2007. ^ "Economic Diversity Among the Top 25 Ranked Schools: National Liberal Arts Colleges". U.S. News & World Report. Retrieved 22 February 2016. ^ College Board. "College Board Profile of Grinnell College". Retrieved 2 October 2007. ^ Leavens, Kennedy. "Need-sensitivity? Admissions may start looking at international students’ bank accounts" Archived 2008-10-21 at the Wayback Machine, The Scarlet & Black, February 28, 2003. ^ Grinnell College. "International Student Financial Aid Policy". ^ a b "Economic diversity and student outcomes at Grinnell". The New York Times. 2017. Retrieved 2018-07-02. ^ "Men's Club Schedules". CWPA. 2013. Archived from the original on 2012-10-28. Retrieved February 2, 2013. ^ "The Sticky Tongue Frogs Grinnell Womens Ultimate". Archived from the original on 2010-06-19. ^ Michael Aguilar (2011-05-24). "News 2011 D-III College Championships – Sunday Open Recap". Usaultimate.org. Retrieved 2016-02-23. ^ Amy Farnum. NCAA Sports. Grinnell Goes Big-Time. January 28, 2005. ^ D3Hoops.com Beloit 86, Grinnell 85 Archived 2007-09-28 at the Wayback Machine. February 3, 2005. ^ Official 2007 NCAA Men's Basketball Records Book, NCAA.org Archived 2007-03-23 at the Wayback Machine Retrieved 7 March 2007. ^ "Grinnell College star shatters Division III scoring record". Rivals.com via Yahoo Sports. 2011-11-22. Retrieved 2011-11-22. ^ "Grinnell's Taylor pours in NCAA-record 138 points". D3sports.com. 2012-11-20. Retrieved 2012-11-20. ^ "D3 Grinnell player scores 138 points in a game to smash NCAA record - College Basketball News - FOX Sports on MSN". FOX Sports. 2012-11-20. ^ Miller, Kerry (20 November 2013). "Grinnell Super Scorer Jack Taylor Opens Up About Stats, Style of Play". Bleacher Report. Retrieved 20 November 2013. ^ "Jack Taylor tops 100 points again". ESPN.com. Associated Press. November 18, 2013. Retrieved November 18, 2013. ^ "Self Governance – Student Affairs | Grinnell College". Grinnell.edu. Archived from the original on 2010-05-27. Retrieved 2010-02-28. ^ "Pioneer Capital Investments". web.grinnell.edu. ^ Peace Corps. Peace Corps Announces the Colleges and Universities that Have Produced the Most Peace Corps Volunteers Archived 2007-09-27 at the Wayback Machine. January 24, 2005. ^ Grinnell College Center for Careers, Life, and Service. Grinnell Corps. Retrieved 18 November 2014. ^ Grinnell College, Student Government Association, Grinnellsga.com Archived 2008-12-11 at the Wayback Machine, Retrieved 13 July 2008. ^ "Commencement", Grinnell.edu, Retrieved 18 November 2014. ^ a b "In Iowa, Pioneering Undergrad Workers Union Keeps Growing | Labor Notes". ^ "UGSDW negotiates 2.7 percent pay raise |". ^ "These Iowa students want their college to be the 'most unionized campus in the country'". ^ "Student Unionization | Grinnell College". ^ "Grinnell College, Running Scared… to Trump – UGSDW". ^ "Iowa College Becomes Battleground for Student Worker Unionization". ^ "NLRB Rules Graduate Students Are Employees with the Right to Unionize". ^ "UGSDW Withdraws Petition, Seeks to Preserve Rights of Student Workers; Grinnell Opposes". ^ a b "Harry Hopkins". U-S-History.com. Retrieved 25 February 2007. ^ "Joseph Nye Welch Biography". The Biography Channel. Archived from the original on 30 September 2007. Retrieved 25 February 2007. "Iowa College" . New International Encyclopedia. 1905.